Heeeeeeey, hey, hey friends! I’m super amped that it’s……dun, dun, dun….FINALLY FRIDAY! 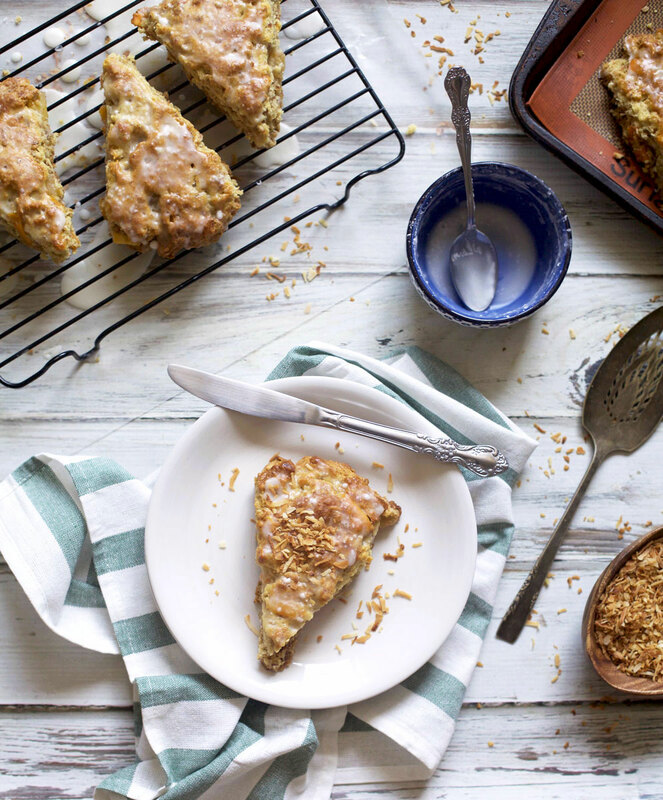 Almost as amped as I am to share these tropical scones with you. Because obviously, getting amped about tropical flavored carbs is the only way to be on a Friday. No, really, it is. I am b-a-n-a-n-a-s for these scones, which is slightly odd considering they have no bananas in them. But they do have all kinds of other delicious tropical fruits and flavors. One of our favorite local bakeries makes a similar scone that I LURVE so much (No, really….I’ve legit made Mr. RC drive all the way back to the bakery after getting home just to get me more AND he’s even asked them to bake more just so I can buy one), I decided it was high time I start making my own. This was partly due to the fact that they don’t always sell them and partly so the Mr. wouldn’t have to chase them down for me. But, let’s be real, it’s mostly because I just want to have them in my life every darn day! When you try them, you’ll total understand why! 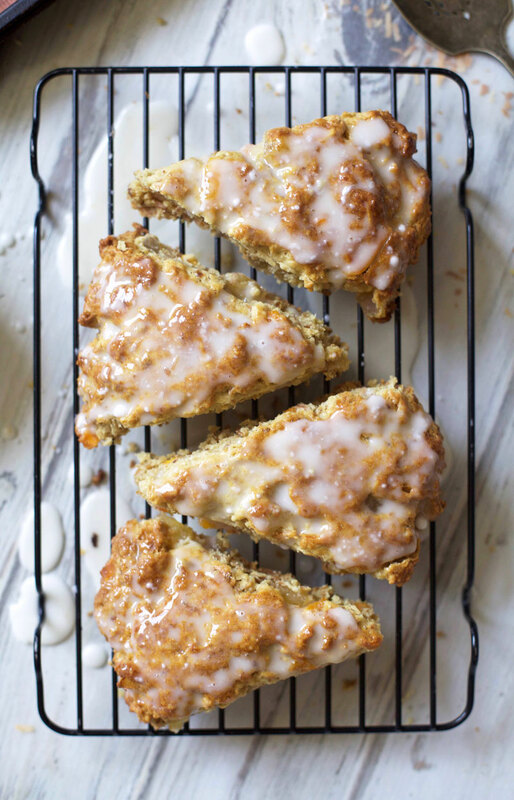 These scones, unlike many you’ll find, aren’t small, they aren’t dry and they aren’t hard. Oh no, no, no! 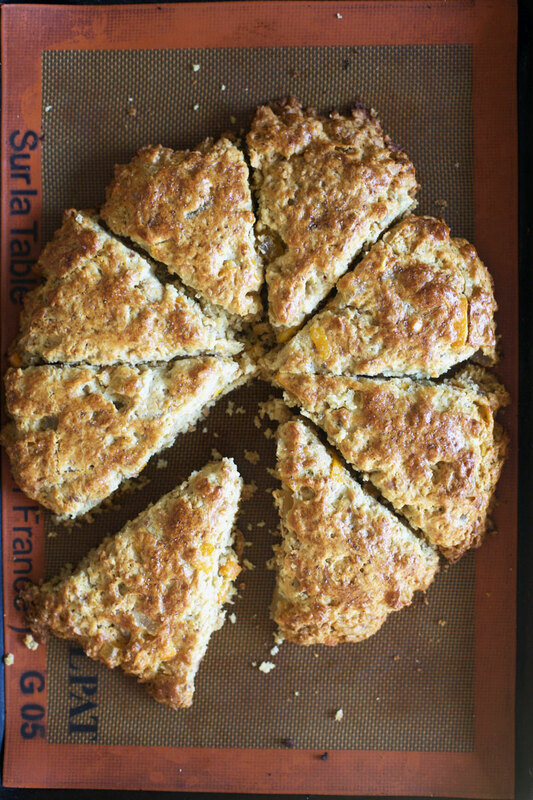 These scones are soft, fluffy and moist. They’re loaded up on mango and pineapple and toasted coconut. And then….wait for it…..they’re topped off with a passion fruit glaze! I knooooooow. It’s wild! I mean, are you getting why I was so amped to share these with you??! Is it making sense??! I sure hope so. But even more, I hope you’ll make them. They’ll totally change your breakfast game! Preheat the oven to 400 degrees. Line a baking sheet with parchment paper or a silpat mat and set aside. In a large bowl, whisk together the flour, brown sugar, baking powder, baking soda and salt. Add in the butter and use your fingers to cut/rub it into the flour until the mixture is crumbly and coarse and the butter has formed pea-sized balls. In a separate small bowl, stir together the buttermilk and egg until combined. Make a well in the center of the dry ingredients and pour the buttermilk mixture in. Next, add the dried fruit, coconut and lime zest. Using lightly floured hands, gently knead the dough together, right in the bowl. Continue kneading until everything is just combined, making sure not to over mix. Place the dough directly onto the lined baking sheet and, using your fingers, shape it into a round shape that is about 7 1/2 to 8 inches wide and about 1 1/2 inches high. Cut the dough into 8 wedges, but don’t separate the wedges. Bake for 18 to 22 minutes, or until the scones start to brown, turning the baking sheet halfway through. You can also check by inserting a toothpick. If it comes out clean, they’re done. Remove from the oven, let cool for 5 minutes, then re-slice and separate the scones. While the scones are baking, make the glaze by whisking together the powdered sugar and passion fruit juice in a small bowl. Once the scones have cooled slightly, drizzle generously with the glaze. Serve them immediately or allow them to finish cooling on a wire rack. These scones taste best consumed within 24 hours, but they will keep up to 2 days when stored in an airtight container.